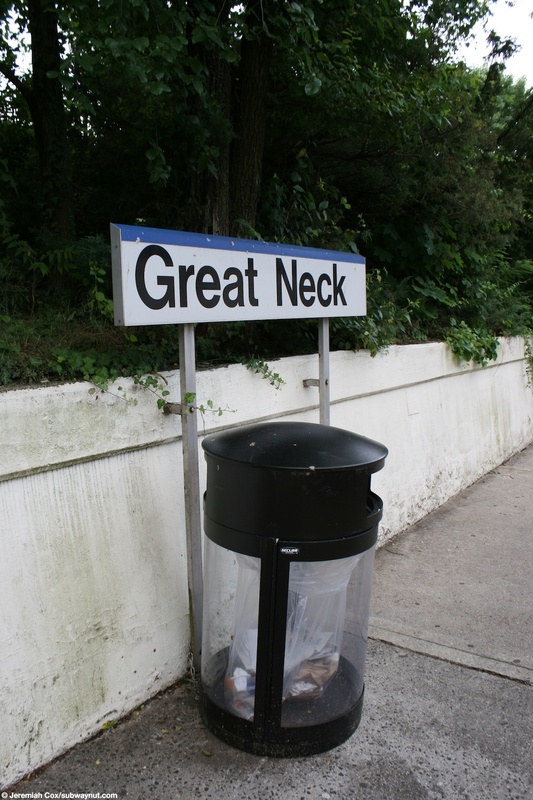 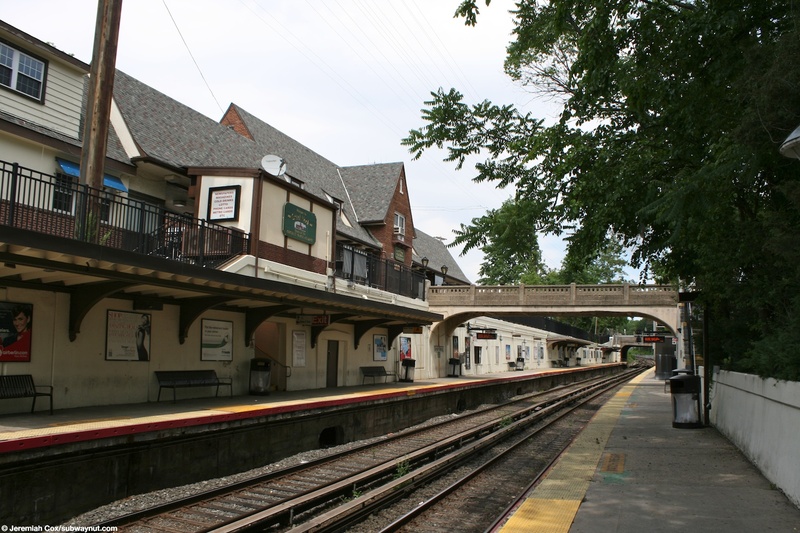 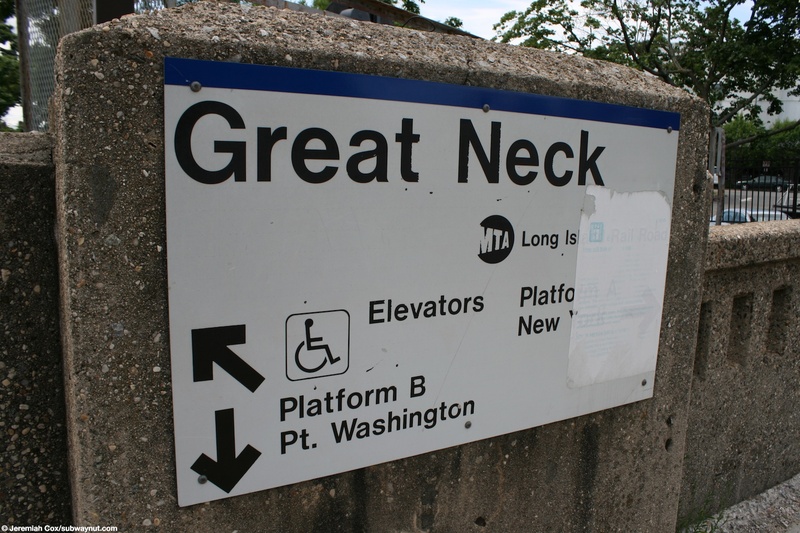 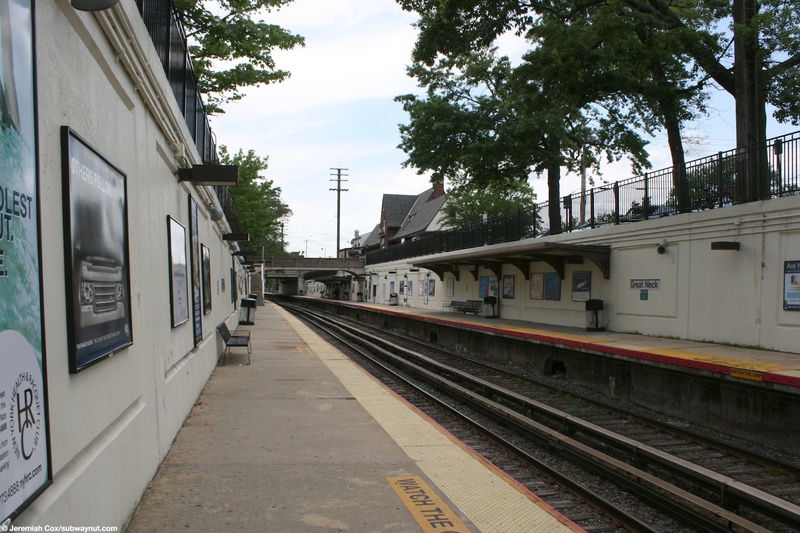 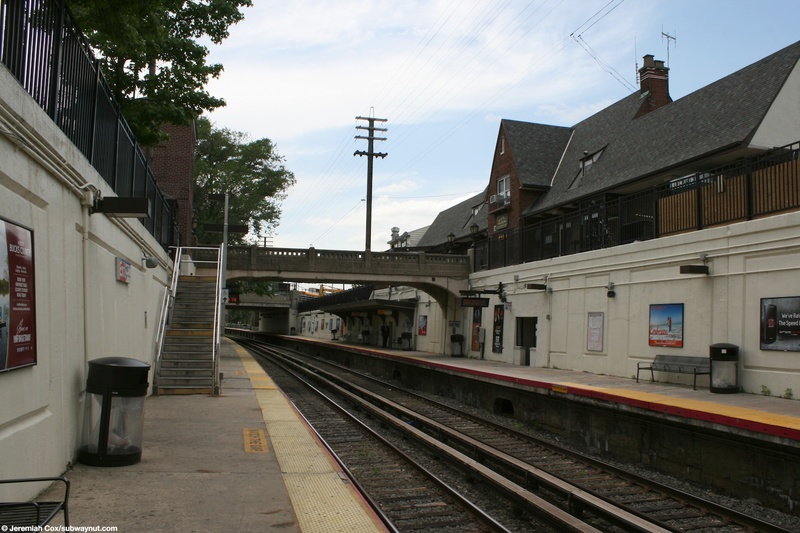 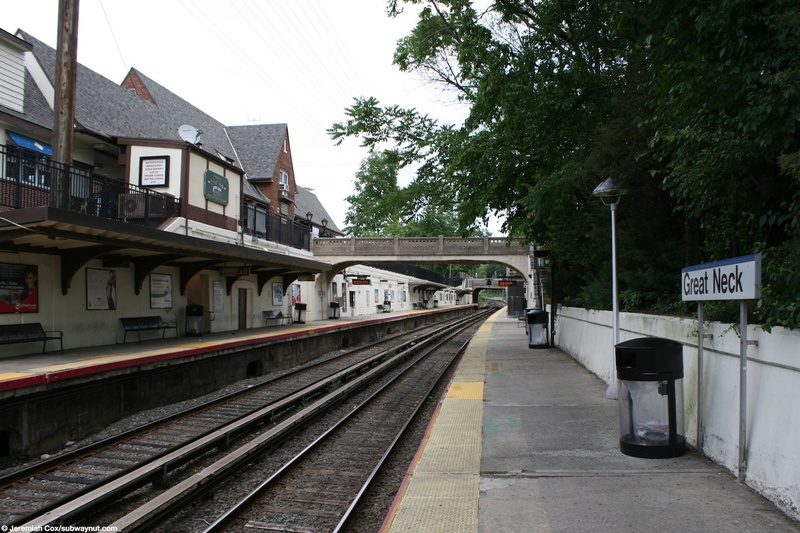 Great Neck is the first station in Nassau Conty on the Port Washington Branch and where many peak hour trains short-turn because from beyond the station all the way to Port Washington the line is only single tracked (which puts intense operating constraints on the entire branch). 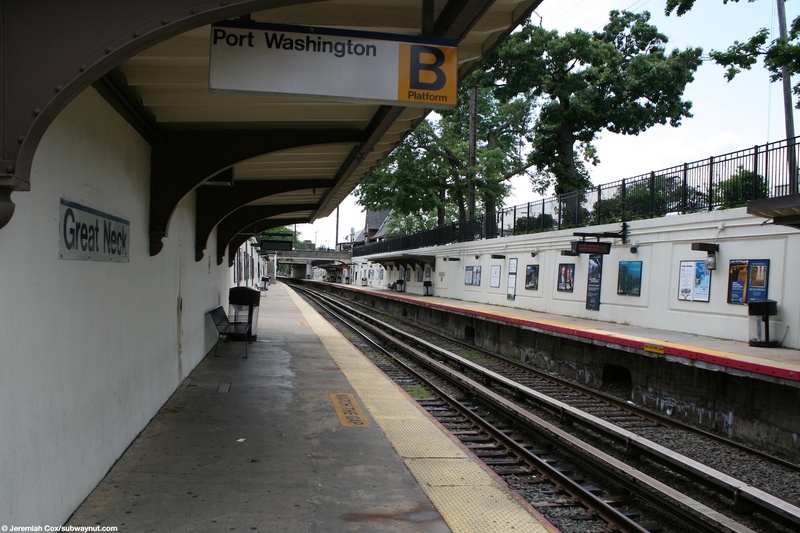 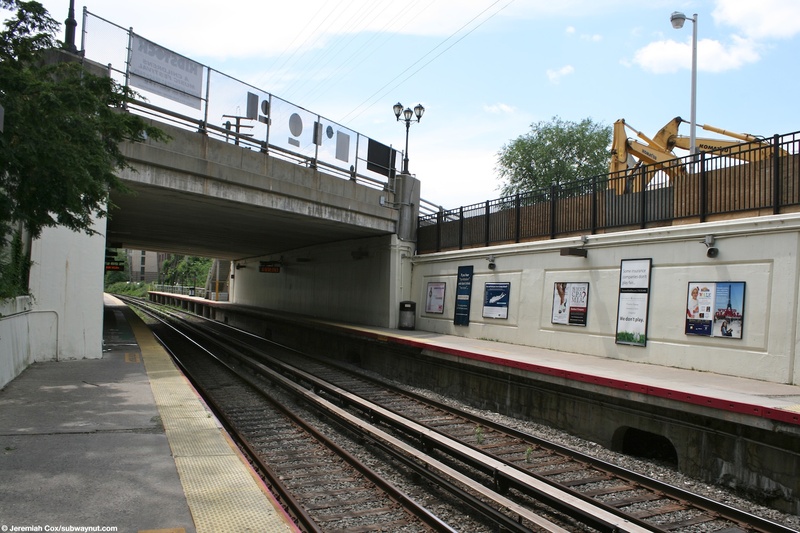 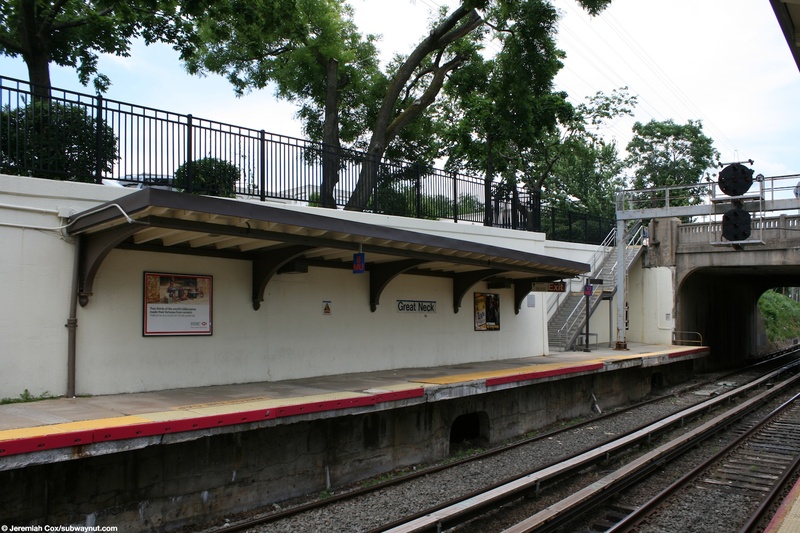 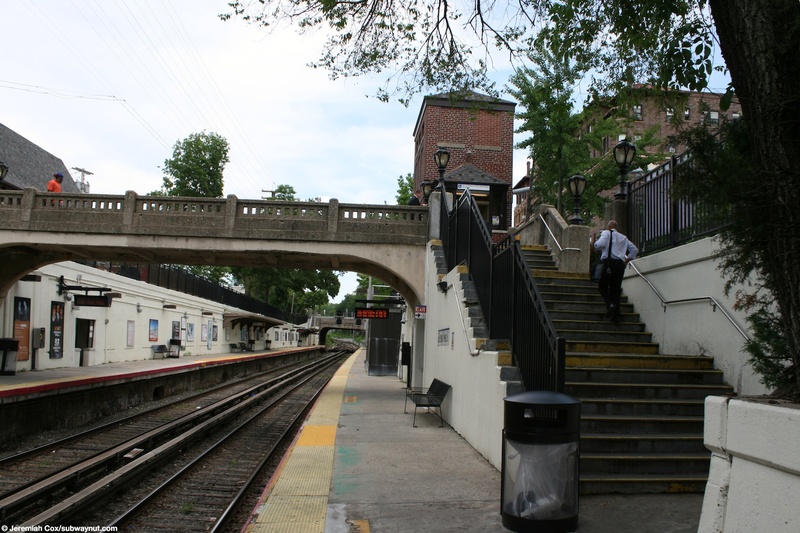 Presently the 114 year-old Colonial Road Bridge and pocket track for turning peak hour trains beyond the station are going under a controversial environmental review process (the standard Long Island NYMBYISMs, the MTA's websites information is here) to replace the bridge and allow the pocket track to accommodate an additional train. 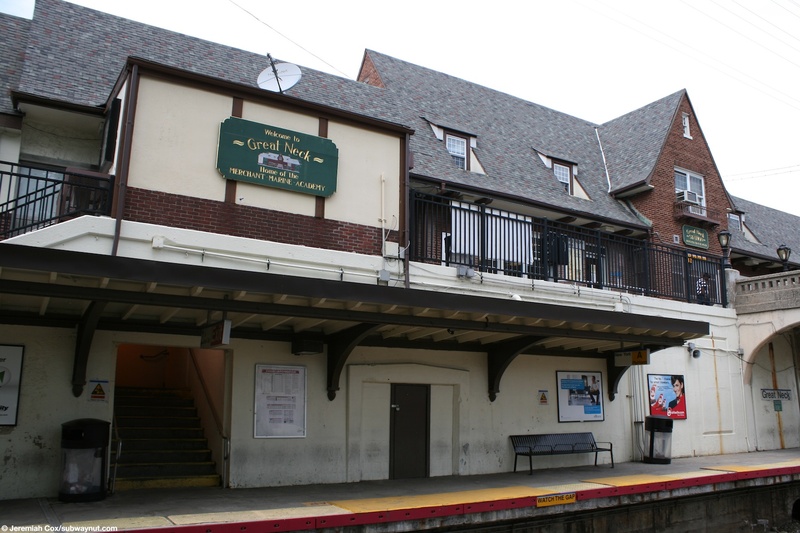 An annex to the main station house (across from it) has become the Colonial Road Improvement Project Information Center, to provide information to the local community about the expansion under the NEPA process. 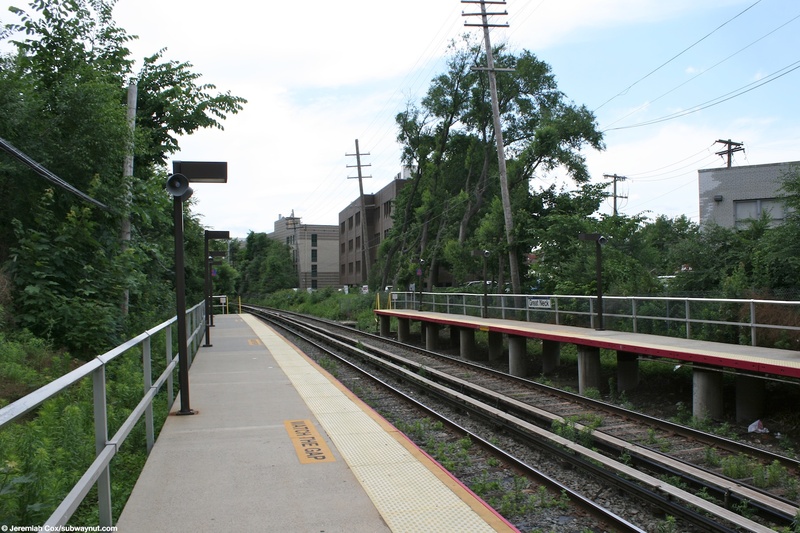 To get to the design of the station, it is located in an open cut near the center of town at Station Plaza. 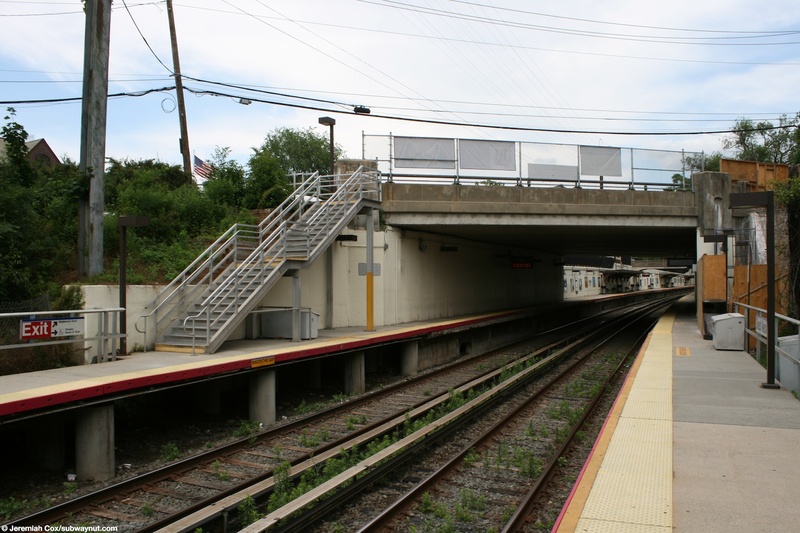 The platform walls are the standard bare but flat and finished looking concrete. 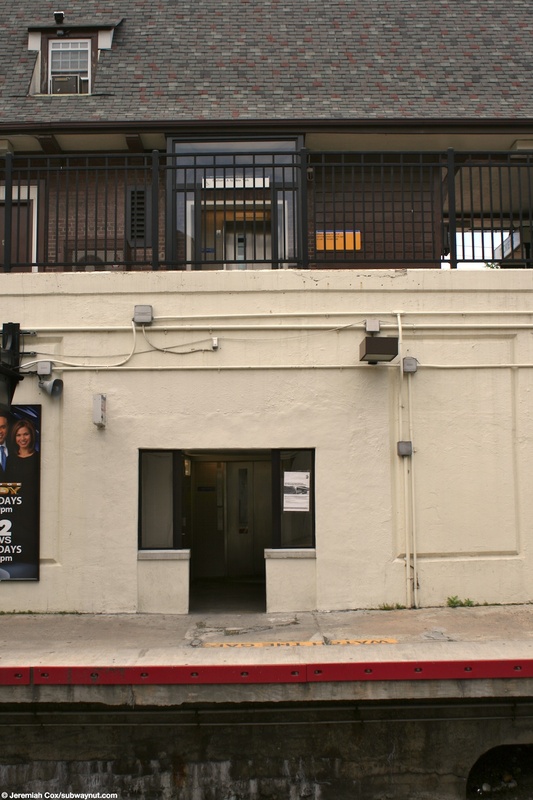 There are some canopies (that look just like those at Bayside) hanging off of the concrete walls providing shelter. 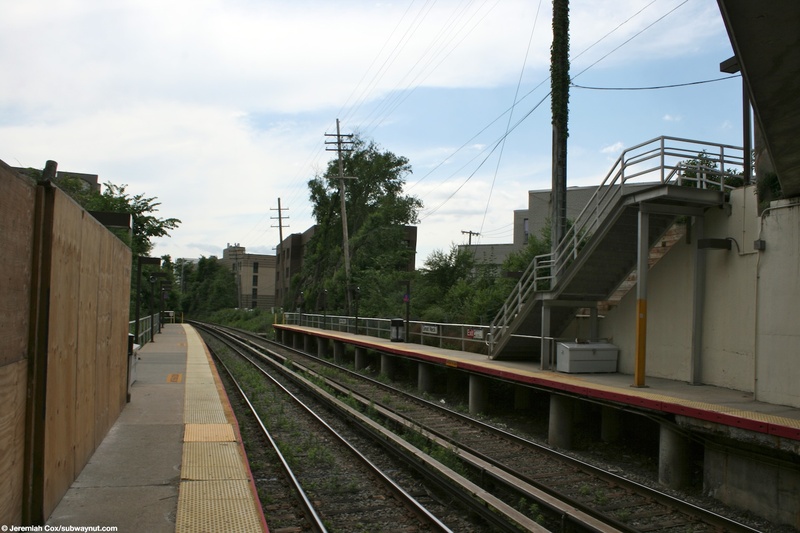 For platform access, starting from the west, there are first staircases up to the west side of Middle Neck Road at its overpass (the staircase up from the Port Washington-bound platform is (as of June 2011) closed and being rebuilt), this is followed in the middle of the platform with two staircases and an elevator, up from both platforms, up to the main entrance to the station where there is a pedestrian overpass (with just low concrete walls) that connects a large brick two story station house north of the tracks (along the New York-bound platform) this house has a newsstand on the east end that is outside and exposed to the elements, some TVMs and the station waiting room (open from 4am to 8:30pm, every day) and ticket office (open for one AM shift from 6:10am to 1:45pm). 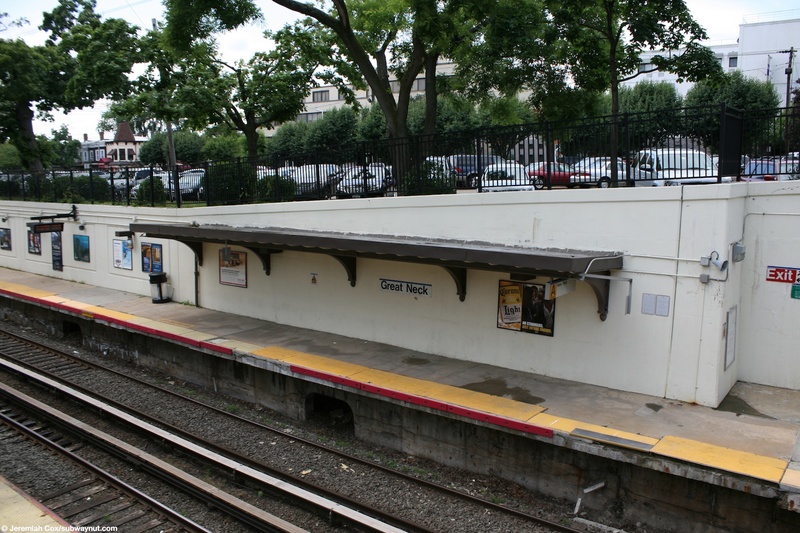 It has the standard overhanging roofs that provide more outside shelter. 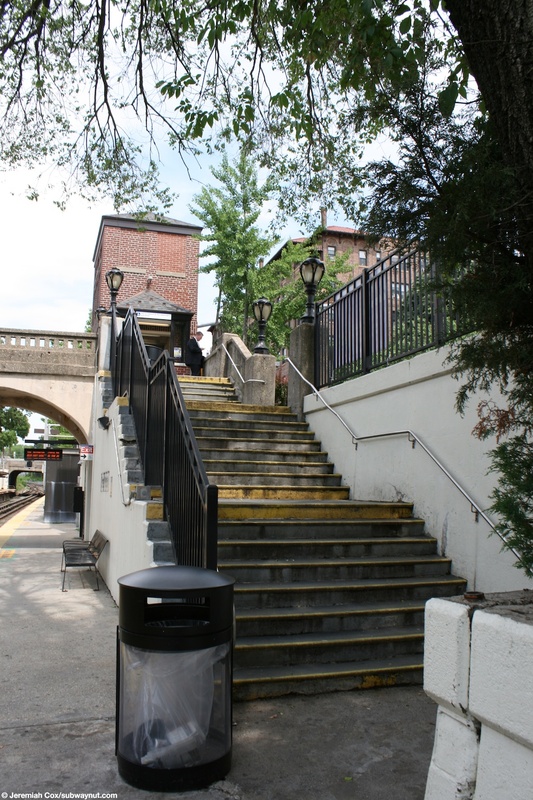 Beyond the station house is a small car loop and a two (N57 and N58) of the stations bus stops that lead to North Station Plaza. 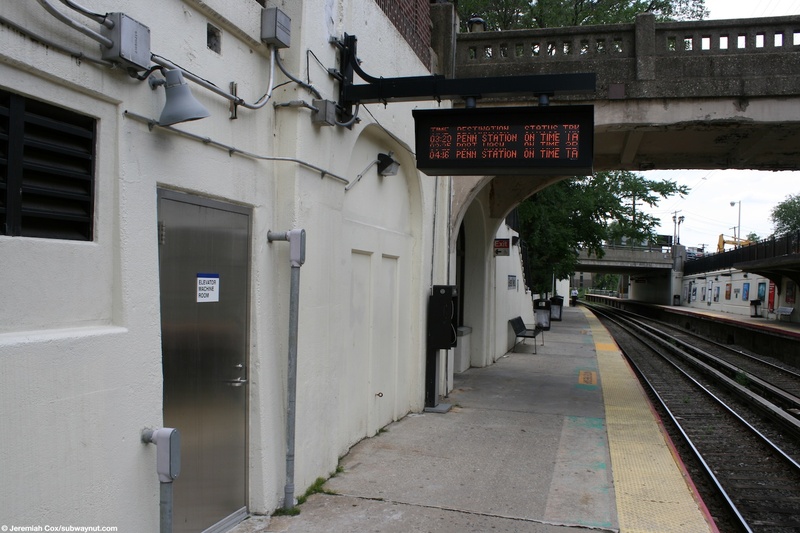 From the Port Washington-bound platform here there is a small brick enclosure for the platform elevator (that looks just like the station house), and the bus bays for the rest (N20, N21 and N25) of the stations buses along South Station Plaza. 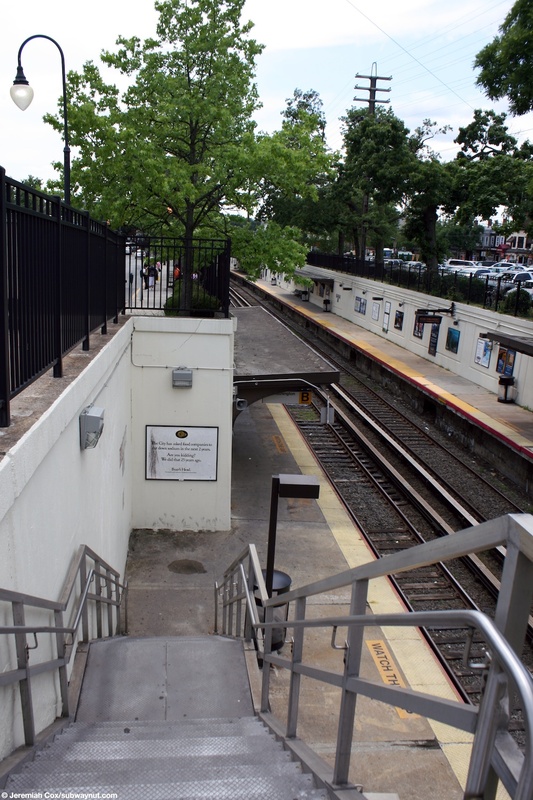 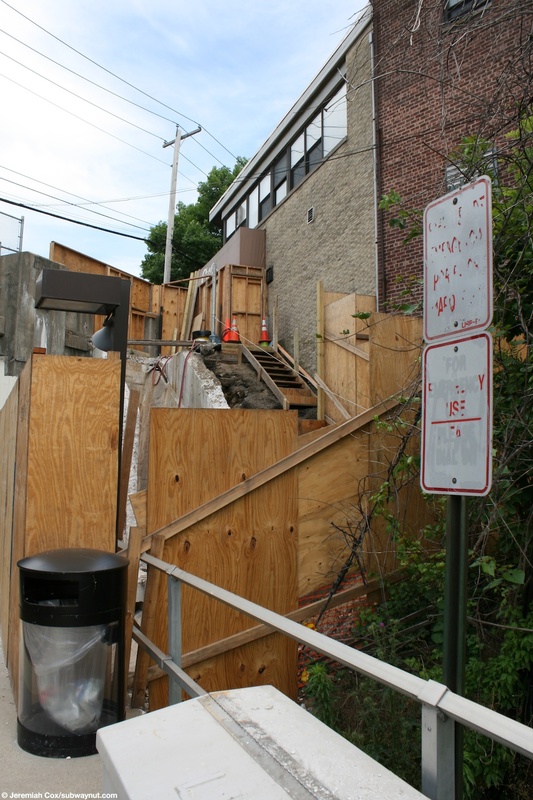 At the eastern end of the stations a staircase leads up from each platform to the west sidewalk of Barstow Road.